Achalasia (Latin; a=absence, chalus=relaxation) is a disease of unknown cause, where the nerves at the lower end of the oesophagus degenerate. As a result the lower oesophageal sphincter (LOS) fails to relax properly during eating and remains closed. Achalasia is uncommon but not rare and has a prevalence of 10 cases per 100,000 population. It becomes increasingly common with increasing age. It is due to degeneration of nerve cells within the myenteric plexus (the nerves within the wall of the oesophagus). The clinical manifestations of achalasia are various. Symptoms are often present for several years before the patient comes to medical attention. The major symptoms include difficulty swallowing (dysphagia) for both solids and liquids, regurgitation, heartburn, weight loss and foul breath. Chest pain is often a major feature in the complex of symptoms. It is often precipitated by eating, can waken the patient at night and may be so severe as to cause decreased food intake and weight loss. In an eighteen-year prospective study of 101 consecutive patients with the diagnosis of new achalasia, 64 reported chest pain. 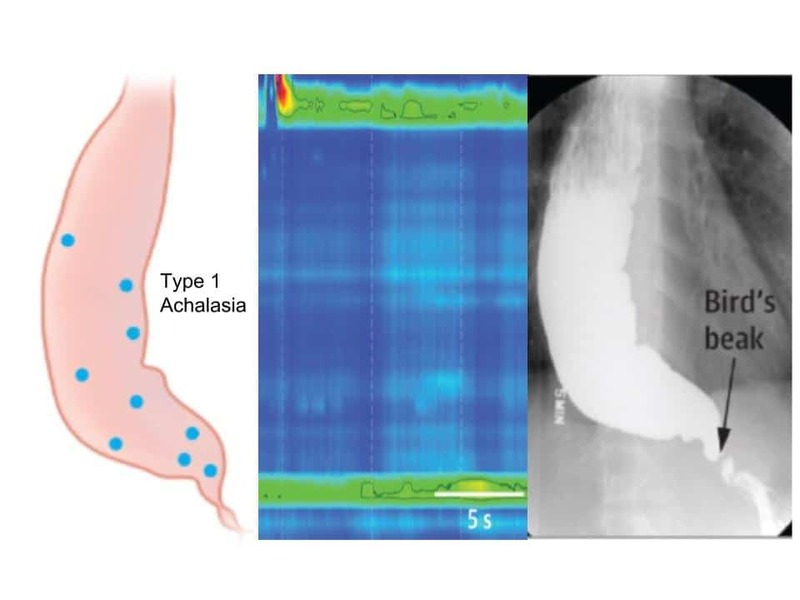 Weight loss is common in achalasia, but with better diagnostic tests over the past few years leading to earlier diagnosis, patients may have a completely normal weight. Treatment may reverse the weight loss or prevent it entirely. There are three major types of achalasia, and all respond slightly differently to treatment. 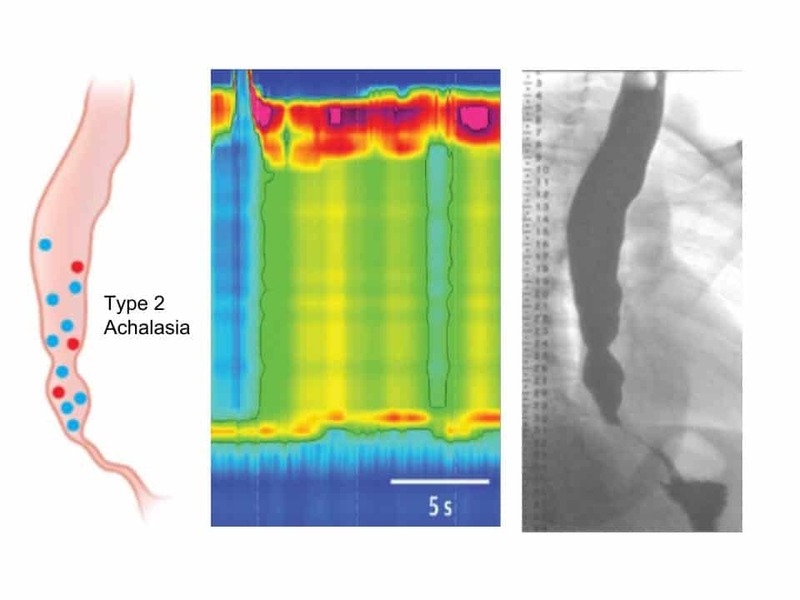 Type 1 shows no motility in the oesophagus and the presence of a high-pressure band near the lower oesophageal sphincter level. In type 2, the lower oesophageal sphincter is always non-relaxed and simultaneous contractions occur throughout the body of the oesophagus while a person swallows. This type is the one that responds best to endoscopic therapy. 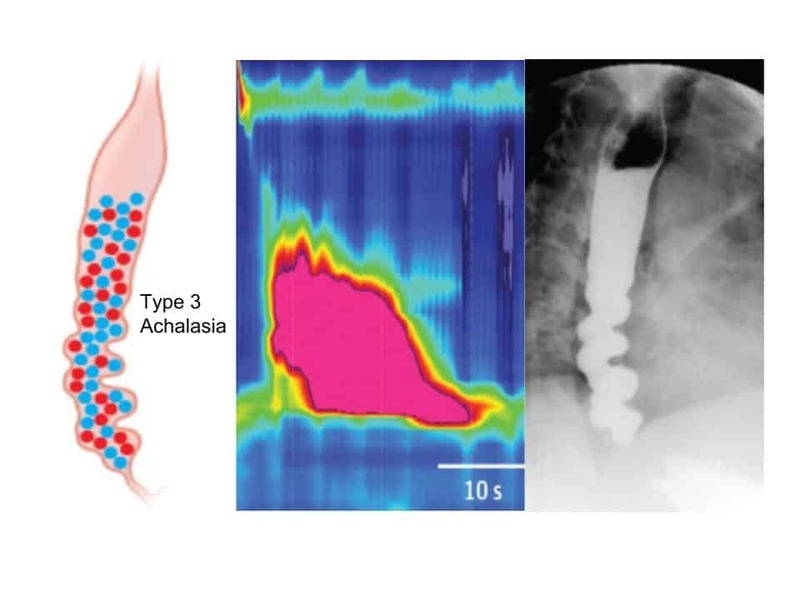 Type 3 achalasia is typically characterised by high-pressure spasms in the oesophagus. This type is also most commonly prone to chest pain that can be difficult to control. The new POEM procedure might have particular value in treating this type of achalasia. The degeneration of the nerves causing achalasia treatment cannot be corrected. Achalasia treatment is therefore directed at reducing symptoms and preventing complications. This is mainly accomplished by reducing the lower oesophageal sphincter pressure because peristalsis rarely returns with therapy. This can be done with drugs, endoscopic dilatation, surgical myotomy and the latest treatment POEM (per-oral endoscopic myotomy). No drugs give long term improvement. Those tried include nitrates, theophylline, calcium channel blockers, particularly nifedipine and botulinum toxin. 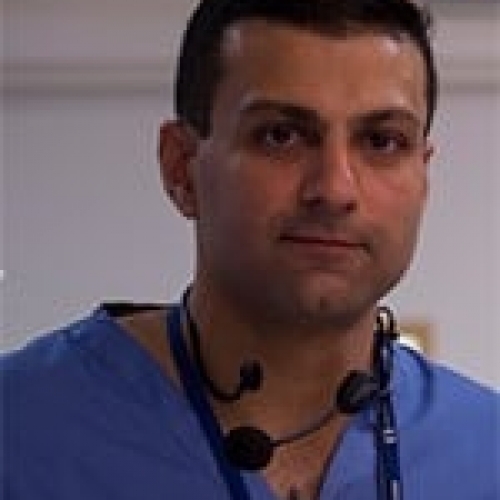 Endoscopic dilatation to a diameter of 30 mm is needed to tear the muscle in the lower oesophageal sphincter and achieve long lasting reduction of sphincter pressure in these patients. Studies suggest resolution of dysphagia in 32-98% of patients with younger patients and those with a shorter duration of symptoms doing less well than older patients. If initial success is achieved, only small numbers will need repeat dilatation at a later stage. In the last few years, it has become clear that doing two dilatations a few weeks apart, the first to 30mm and the second to 35mm diameter gives a better functional outcome. Surgical myotomy (dividing the muscle in the oesophageal wall) is associated with good functional improvement in 65-92% of patients. Gastroesophageal reflux may occur after surgery in anything up to a half of patients. Myotomy and endoscopic dilation can both be used in the same patient at different times. So if a patient has initially benefited from dilation and later on the problem returns, surgery can be considered. Similarly, if surgery has worked initially but symptoms return, endoscopic dilation can be considered at that time. POEM is a relatively new treatment. This is a hybrid between traditional endoscopic and surgical techniques. 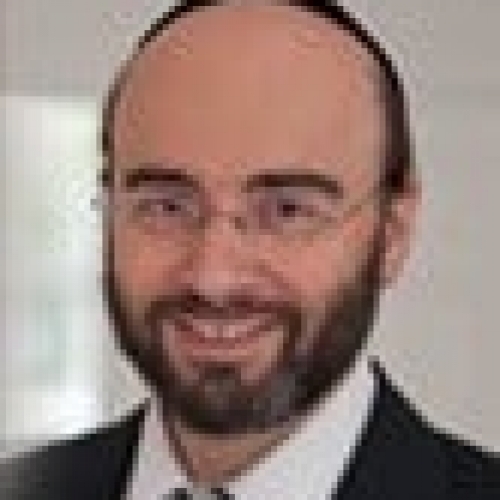 It appears to be as good as either of the more established techniques and may have a particular benefit in patients with type 3 achalasia. 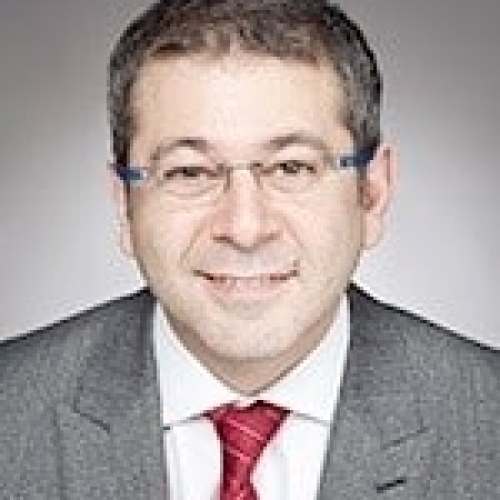 If you wish to discuss achalasia and its treatments in London with one of our specialists, please do get in touch. The oesophagus is a long muscular tube measuring 25cms, which connects the back of the thrhttps://www.gastrolondon.co.uk/cancer-prevention/oat to the stomach. Food is propelled through the oesophagus by a co-ordinated series of contractions of the oesophageal muscle. These are called peristalsis. The oesophagus has nerve input from two sets of nerves which emerge from the central nervous system. In addition, the gut wall has an intrinsic nervous system (the myenteric plexus). The degree of contraction or relaxation of any part of the oesophagus is due to a complex interplay between these various nervous inputs. The muscular coat of the oesophagus has two layers. The inner layer is circular and the outer layer is longitudinal. When a person swallows a peristaltic event is triggered. It starts with the longitudinal muscles of the oesophagus contracting in sequence to shorten the oesophagus. A ring like contraction of the circular muscles then sweeps along the oesophagus to propel the bolus of food into the stomach. Most assessments concentrate on the distal (lower) two thirds of the oesophagus. Normal values on manometry studies have been calculated through the study of large healthy populations (1). Other tests which can be useful in making the diagnosis include barium swallow and gastroscopy. Abnormalities in the motility of the muscle of the oesophagus can lead to symptoms of chest pain and dysphagia (difficulty swallowing). The classification for most disorders of oesophageal motor function is imprecise. Achalasia has a defined and identifiable pathological series of changes associated with it but other motor disorders do not. Chest pain can be associated with any disease of motility of the oesophagus. Patients may initially present to a doctor with what is thought to be angina of cardiac origin. In addition, a significant proportion of patients with gastro-oesophageal reflux disease may suffer with ‘atypical’ chest pain which presents as angina. It is well recognised that these patients often restrict their lifestyle believing they have heart disease (2). These patients often respond to proton pump inhibitor drugs which profoundly suppress production of acid in the stomach. A problematic feature of patients with oesophageal dysmotility syndromes is that there is an inconsistent association between oesophageal symptoms (such as chest pain), degree of dysmotility and psychological symptoms. In a study of 113 patients with various types of oesophageal dysmotility disorders, those with achalasia and diffuse oesophageal spasm had normal psychometric profiles. In contrast, those with other dysmotility disorders had increased psychological abnormalities including depression. Interestingly, in the entire cohort of patients, the presence of chest pain was closely associated with the presence of psychometric abnormalities (3).